As Kent celebrates its 50th year, and at PSSRU we celebrate our 40th year, it seems fitting that one of our key research areas developing the Adult Social Care Outcomes Toolkit (ASCOT) be featured in the 50th birthday edition of the Kent Research: Making a Difference magazine, just released. 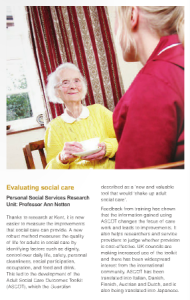 Professor Ann Netten has worked in PSSRU for many years, and her article draws attention to ASCOT and the impact it is increasingly having within the social care sector both in the UK and internationally. Two of our colleagues recently returned from Finland where the toolkit has become widely used, and they have shared their experiences. The Guardian has described ASCOT as a ‘new and valuable tool that would shake up adult social care’. Read David Brindle’s full article.